I can share with you everything I have learned about nutrition and plant based foods, but when it comes down to it we use to eat without even considering this. Now we have all these buzz words and catch phrases on foods, or may be Dr. BlahBlah mentioned it on TV. Words like; “antioxidants,” “omega-3,” “gluten,” “saturated fat” and so on. We like to eat something knowing that it’s loaded with Vitamin C, and that must be a good thing. Or antioxidants can prevent us from getting sick so let’s load up. Nutrition Science is a study that is roughly 200 years old which is pretty much a baby in the science world. Our instincts and intuition help us choose the foods that our body needs. But because of processed foods or what I like to call mock foods, we have lost this connection. On this website I do share loads of nutrition information because sadly that seems to be the best way to reel people into eating real whole plant based foods. But I also hope that by doing this people will gradually feel a difference if they adapt may be a green juice a day, a vegan meal a day or may be just a side of vegetables for the first time. I would love to help people tap into their intuition again. By sharing my experiences, juices, meals, views on products and so forth. The real “proof” is my own personal experience, your “proof” will be your experience. So let’s visit my sort of mission statement or as I prefer to call it my food morals/policies. Do not eat anything that you would not find the ingredients for in a person’s home. Do not eat anything that you can not pronounce and or can not define an ingredient. Do not eat anything that has a commercial, real food does not need commercials. If it has crazy packaging, back away, chemical storm coming your way otherwise. Do not eat anything that has a shelf life of a year or more, there’s no way that’s actually food! Shelf life items in general give me the hebejebes. Stay away from the middle section of the grocery store, it’s all mock foods. If a product has a label on it stating “low-fat” it’s safe to say that it is probably high in sugar or salt to “make up for flavor.” Which when it comes down to it, other addicting ingredients that will make you hungry and keep filling your basket have been added to it. This also goes for “low salt” or “no sugar” items. It has been proven that according to your ancestors background you are already wired to be more addicted to one of these ingredients. 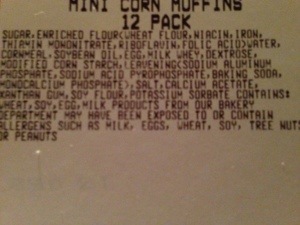 Marketing, packaging and the ingredients used completely abuses this information. Let’s say you have a friend, relative or etc. who is visiting from another country, take them to the grocery store. Observe what they recognize and do not recognize. If they ask you “what is this?” question it yourself. This is most likely something like a Lunchable meal, candy bar, chips, squeezable yogurt…mock foods. Similar, be wary of artificial colors which are chemical compounds made from coal-tar derivatives to enhance color. Many people are actually allergic to this and some of the symptoms are; fatigue, asthma, rashes, hyperactivity and headaches. As a whole, if we can make more conscious decisions we all can feel and be better people. Part of being a consumer is putting your energy, energy is also your money, into the products or things you buy everyday. Think about what you are supporting, sharing or putting your energy into and what will come afterwards. Find a lifestyle that works best for you. Something that makes you happy, excited, it sticks, and you feel healthy. May be it’s eating vegetarian but having turkey on Thanksgiving. Or may be you are a raw vegan but you eat cooked grains and root vegetables. It is completely up to you. If you eat something you do not want to admit to someone, just like if you do anything in your life you regret or do not like to admit then that’s probably something you shouldn’t be doing in the first place. Great article! We are in the process of eating only whole, plant-based, non-processed foods. Although my better half has identified as a vegetarian for more than 25 years I don’t feel the need to label myself as this or that. Reading articles of whats *really* in factory phood was enough to guide me in the right direction. It would be great if you could add an image to this article so I can save it to my Pinterest board, it could help a lot of people come to make better choices too. Thank you Allie for taking the time to check out my site. I completely agree with what you are saying and am happy to hear some of your experiences. I currently am not surrounded by like minds where I am living, so I am trying to find baby steps or a half way point to connect with people. Hopefully taking these little steps, as people see that they feel better, learn more about the benefits for our environment, health, spirit and living then may be a vegan lifestyle will resonate with them. Or possibly seem more “do-able” if it didn’t feel that way before. Everyone needs to have their own experience, I gradually went from vegetarian to vegan to raw vegan. That’s what happened to resonated with me and these food morals get some ideas popping into readers minds if they are feeling overwhelmed. Best wishes and thank you again.